Remember the snow in January? For couples who were married on the weekend of January 19-22nd, it was gumby time. 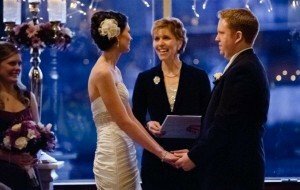 I had the pleasure of joining David and Keri Morgan for their wedding ceremony at The Canal in Ballard on January 21st. And it wasn’t an easy road to get there. And once there, what a joy and what an honor to share in this wonderful couple’s wedding day. Working with Wedding Planner Rebecca Grant, David and Keri had lots of details and pieces to “re-arrange” during their wedding week. Then it came to their wedding rehearsal, which was quickly re-scheduled to the next day. On the new rehearsal day, the weather was still dicey and I was committed to getting into Seattle. Long story short, I made it. Rebecca made it. David, Keri, their wedding party and family made it – yeah! On January 21st, sunshine! After all of the crazy and wacky weather of the week and all of the angst around planning details for this couple, a beautiful, pristine, sunny, crisp/cold and sweet wedding day. When it comes to a wedding day, there is most often always “something” that goes wrong. When it’s weather, my best counsel is to focus on what you can control and let the rest go. For David and Keri, this worked beautifully.